Another great marinade! Citrus Chicken! 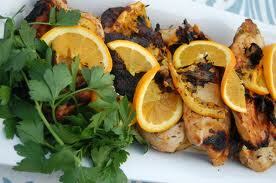 This marinade’s base flavor and acid are both citrus derived. Orange juice provides enough acid, natural flavor and sweetness to cover many of the bases. Add a few accentuating elements, and there you go! I must say, this goes best with chicken (thighs are of course my first pick). And, of course, this is a grilling recipe. Nothing is more appropriate. Sink your chicken into this marinade over night, get a hot wood grill going, liberally season the meat with salt and pepper, and have fun with it. Incredible. Method: Mix everything together thoroughly in a mixing bowl. Add chicken and work marinade into chicken. Cover tightly and seal. Let sit overnight before grilling. Grill this chicken over high heat along with a few grilled slices of orange to final seasoning and garnish (grilling the citrus will bring out sweetness and flavor). Serve with your choice of great grilling sides.